Section § 607 of the FCRA deals with the relationship between CRAs and employers of reports. Additionally, the CRA must provide notice to furnishers of information regarding their responsibilities under the FCRA. Identity and Purposes of Credit Users – Section 607 states that CRAs need to take reasonable measures to make sure that they do not violate section 605 (See Part 2 of our series) Furthermore, a CRA is required to make sure that consumer reports (background checks) are only being used by appropriate people and for legitimate purposes, as spelled out in Section 604 (Part 1 of our series). CRAs are responsible for taking reasonable means to verify the identity of an employer/prospective user and ascertain that the background check will be used for permissible purposes. 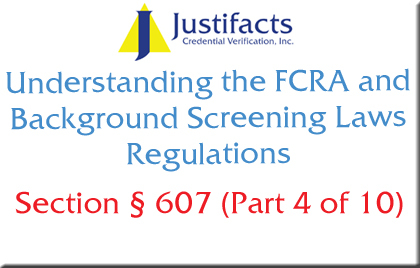 A CRA cannot furnish a background report if it has reasonable grounds for believing that the report will not be used for a purpose listed in section 604 (Part 1 of our series). The Accuracy of Report – A CRA must follow reasonable procedures to ensure maximum accuracy of the information concerning the individual about whom the report relates. Disclosure of Consumer Reports by Users Allowed – A CRA may not prohibit an employer from disclosing the results of a background check to an applicant if adverse action against the applicant has been taken by the employer-based in whole or in part on the report. Notice to Users and Furnishers of Information – A CRA shall provide to any person who regularly furnishes information to the CRA with respect to any applicant; or to whom a background check is provided by the CRA, a notice of such a person’s responsibilities under this title. The FTC shall prescribe the content of notices under this paragraph, and a CRA shall be in compliance with this subsection if it provides a notice under this paragraph that is substantially similar to the FTC prescription under this paragraph. Procurement of Consumer Report for Resale – A person may not procure a consumer report for purposes of reselling the report (or any information in the report) unless the person discloses to the CRA that originally furnishes the report the identity of the end-user of the report (or information); and each permissible purpose under section 604 for which the report is furnished to the end-user of the report (or information). A CRA, such as Justifacts, is responsible for ensuring that our clients are legitimate businesses. The background checks that we provide our clients may only be used for specific purposes. A CRA must take reasonable means to provide an accurate background check. If an employer chooses not to hire an applicant based on his/her background check, the applicant has a right to that information. A CRA is responsible for providing furnishers of information with a notice of their responsibilities. Finally, any employer requesting a report may not resell the report without disclosing to the CRA the identity of the end user and the permissible purpose for which the report is requested.